Georgetown’s 2010 Lannan Literary Symposium and Festival will explore the most vital and purposeful connections across the themes in its title, Literacy, Literature and Democracy; the Symposium welcomes a rich selection of writers, journalists and activists to the Georgetown campus over the two days following Easter break, Tuesday 6 and Wednesday 7 April, to discuss and to demonstrate how universal access to literacy, critical attention to the urgency of the creative imagination and to the power of the written word, and care for the fragility of authentic democracy must all equally concern citizens working for justice in our contemporary world. Guests to Georgetown include noted writers Dave Eggers, Chris Abani, and Uwem Akpan, SJ, journalist, writer and Mother Jones founder Adam Hochschild, social justice activist Mekonnodji Nadingam, poet Thomas Sayers Ellis, and recent Georgetown alums Happy Johnson (COL ’07) and Allison Correll (English MA ’09). Topics across two days of readings, roundtables and performances will include local and national literacy projects like Mr. Eggers’ 826 Valencia and 826 DC, literary, cultural and practical responses to historic challenges like the rebuilding of New Orleans after Katrina, and the ongoing global refugee crisis, with special focus on vulnerable populations in central Africa; the Symposium concludes with a special tribute to the poet Lucille Clifton by former Maryland poet laureate Michael S. Glaser and readings in her honor by Mr. Ellis and Mr. Abani. Participants from the Georgetown Community will include Professors Deborah Tannen, Maureen Corrigan, and Michael Eric Dyson, as well as Professor Carolyn Forché, the Director of Georgetown’s Lannan Center for Poetics and Social Practice. For more information please contact Professor Ricardo Ortíz at ortizr@georgetown.edu. 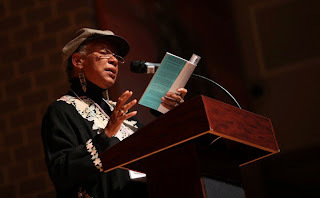 Esther Iverem reads at the 2008 Festival during the DC Poets Against the War panel. 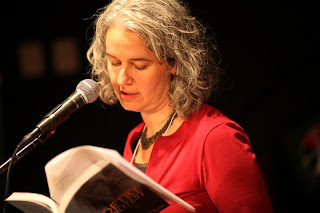 Featured Poet Carolyn Forché reads at the 2008 Split This Rock Poetry Festival. Split This Rock invites you to our Post-Festival Thank You Reception. We'd like to express our appreciation for your significant contribution in making the 2010 Split This Rock Poetry Festival a success. Stop by for some snacks and drinks! This is also a great opportunity to collect your festival t-shirt if you have not already. Please RSVP by contacting Program Associate Abdul Ali at ali at splitthisrock dot org or calling 202-787-5210.
start tearing down the bars. 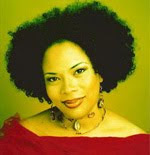 Excerpt from “Say Yes” from Pole Dancing to Gospel Hymns (Write Bloody Publishing 2008). Used by permission. 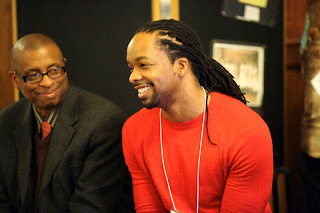 Gibson was featured at Split This Rock Poetry Festival: Poems of Provocation & Witness, March 10-13, 2010 in Washington, DC. The festival presented readings, workshops, panel discussions, youth programming, film, and activism—four days of creative transformation as we imagine a way forward, hone our community and activist skills, and celebrate the many ways that poetry can act as an agent for social change. For more information: info@splitthisrock.org. Be on the lookout for dates for the next festival in 2012! A thousand Nigerian soldiers surrounded the Kalakuta Republic and burned it to the ground on February 18, 1977. As republics go, Kalakuta wasn't very large. Only 100 or so people lived there. But the immensely popular musician Fela Anikulapo-Kuti had created this compound, in the Nigerian capital of Lagos, as a joyful and democratic space in an otherwise corrupt and dictatorial country. The sovereignty of Fela's republic was always under threat. And even though the invaders threw his mother from the second floor on that day in 1977, and even though the soldiers cracked his skull, and even though the government jailed him for trying to defend himself, Fela continued to fight back. He used his Afrobeat music and biting lyrics as his weapon. "Too much sweets will give you rotten teeth," Fela declares in the new musical that recreates Kalakuta on Broadway. "Too much Nigeria will give you broken heads, burned houses, dead students." Fela had about as much of Nigeria as any one person can handle, yet he remained powerfully attracted to the country that his mother had devoted so much of her life to liberating from colonial rule. He put out more than 70 records, toured the world, and shared the stage with other famous musicians. But he always came back to Nigeria, where he hoped one day to become president. The Broadway show, which is a powerful cocktail of music and dance and politics, doesn't provide much detail about the rotten state of Nigeria. It is, after all, a musical. And Fela's songs, though sharp and critical, tend toward general, even allegorical, indictments. The song "Zombie," for instance, doesn't mention Nigerian soldiers by name but rather critiques their well-known reputation to follow whatever orders they are given. Fela's protests are multi-barbed, and can be easily applied at home and abroad. At one point in the Broadway show, during the song "International Thief Thief," dancers hold up signs accusing not only villains of the Nigerian drama like Shell, but also more universal targets like Halliburton and the International Monetary Fund. Given the squalor of Nigeria, it's hard to believe that the country is now the world's eighth-largest exporter of oil. "Nigeria earned more than $400 billion from oil in recent decades," writes Peter Maass in his new book Crude World, "yet nine out of 10 citizens live on less than $2 a day and one out of five children dies before his fifth birthday. Its per-capita GDP is one-fifth of South Africa's." This comparison is particularly painful, and explains Fela's comment in the excellent documentary Fela: Music Is the Weapon that even then, during the apartheid era, "the situation here is worse than in South Africa. "There were actually two Kalakuta Republics. Fela got the name for his little Monaco of music from the time he spent in prison, when he discovered that the prisoners nicknamed his jail the "Kalakuta Republic." In Swahili, "kalakuta" means "rascal." As Fela explains, "If rascality is going to get us what we want, we will use it; because we are dealing with corrupt people, we have to be 'rascally' with them." The Nigerian poet Chris Abani also uses music as a weapon: the music of poetry. His collection of poems, entitled Kalakuta Republic - named for the prison where he too spent so many days - includes the powerful "Ode to Joy," about a young boy of 14 whom the police torture to death when he refuses to finger an innocent man. 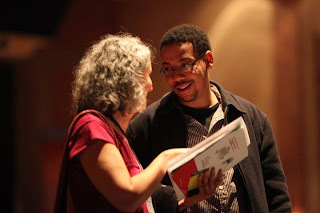 Chris Abani headlined Split This Rock poetry festival last week here in Washington, DC. 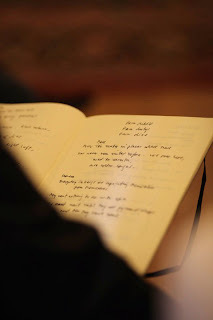 It was a mighty gathering of word-warriors from around the world. The festival began during the dreary days of the Bush administration, a group of the most tone-deaf, word-challenged, and brute politicians as we've ever had to endure in this country. We live in more enlightened times, perhaps, when the "Black President" that Fela sang about has come to occupy the White House. But we continue to fight in Iraq and Afghanistan. We continue to enrich the Pentagon beyond its most extravagant dreams. And we continue to freeze all other government endeavors because of our deficit (of imagination). For a few days, however, the poets of Split This Rock created their own Kalakuta Republic here in Washington: a refuge for those who believe that art can transform our world. It is, for the moment at least, a republic as small as Fela's was. The United States "continues to turn up individuals making works of art," writes essayist Lewis Lapham in TomDispatch, "but they traffic in a medium of exchange on which the society doesn't place a high priority." Still, the sounds and the words produced in Fela's Kalakuta continue to resonate in our own republic of letters - on Broadway, in Chris Abani's poetry, and in political music from Springsteen to M.I.A. The children of American, Vietnamese, or Chinese soldiers, these six rising poetic stars showed us how war extends itself into the domestic sphere of life. The poems demonstrated the curiosity of children who understand “war” is not a dinner-table subject, and the spiritual strength of adults who have the power to imagine the truth. These writers owe not only their creative impetus, but also their lives, to the war. Without the war, Cathy Linh Che said, many of us would not have been poets, we would not have lived in the U.S., and we would not have been born. As one panelist recited poems about her childhood experiences with her father, she came to the line “I don’t like you very much today,” then thanked our crowd and invited the next panelist up to read. She sat in front of me. During the remainder of the reading, I watched the panelist cry. I guess another really awesome thing about festivals like this is how they make you want to write. 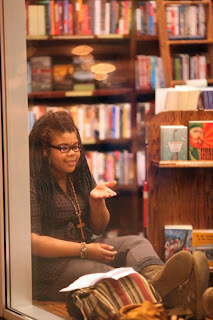 I foresee a poem in a word document, one about a girl reading a poem. Maybe her mouth will be an almond blossom. Maybe her words will be petals, and her tears, pearls of silk. I want to thank Patricia Monoghan and Michael McDermott, the co-founders of Black Earth Institute for inviting me to join this year's panel. Along with Patricia, Annie Finch, Judith Roche and Richard Cambridge, I spoke a panel, Speaking for the Silenc(e)d and of course, being the gentle contrarian that I am I spoke about listening--that we who speak are often speaking to indifferent, hostile or simply deeply ignorant audiences and that we have to start thinking of new ways to open ears. The panel was rich in information and deep connection to a rnage of communities from Annie's talk on collaboration in her Wolf Song project; Judith's work with incarcerated girls; and Richard's discussion of the media's mindset vis a vis our un-neighborly relationship with Cuba. Our audience was terrific--I got to meet Tracy Chiles McGhee and all the way from NYC, Marie Elizabeth Mali and Victoria Sammartino--teachers, arts group organizers, librarians, poets all. Patrica M. opened up the room for discussion and poetry and Victoria read an amazing piece about the incarcerated girls that she has worked with. It was deeply moving. 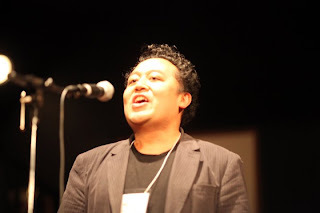 Poets can play a unique role in a country's politics, culture and social movements. They act as innovators, visionaries and truth tellers. Three poets from different cultures — Iraq, Puerto Rico and New York — talk about the role of poets and poetry in different places. The three are part of the Split This Rock Poetry Festival in Washington, DC. 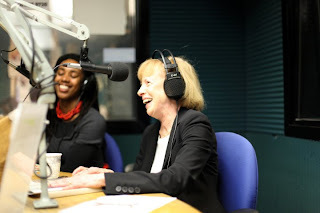 Many thanks to Jill Brazel for the amazing photographs here. 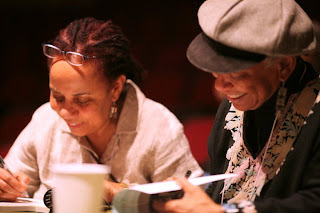 Lillian Allen and Nancy Morejόn sign books for festival goers. The following is a tribute to Howard Zinn written by Busboys and Poets owner Andy Shallal for the Split This Rock Memorials. Most historians report history – Howard Zinn made history through the history he reported. When asked about being objective about writing history – he replied with his signature saying – you can’t be neutral on a moving train. It is also the name of his autobiography and a film about his life. He understood that writing about history it is not what you say that matters but what you leave out. So he wrote about what has historically been left out in history books – he wrote about the steel mill workers and the robber barrons. He wrote about the disaffected and disenfranchised. His books went beyond heroes and holidays and into the lives of ordinary people – people like you and me – people who believe that peace and justice is not just something to dream about but an attainable goal. The people he wrote about did not wear a cape or leap tall buildings in a single bound – they were people who organized and fought back when the odds were clearly stacked against them. I learned about people like Eugene Debs, Helen Keller, Emma Goldman, Jack London and Upton Sinclair were wonderful writers who joined the movement against war and injustice, against capitalism and corporate power. A People’s History of the United States became my go to book – it was everything you always wanted to know about history but were afraid to ask – I can honestly say that it was the most important book I ever read. Howard understood the power of history – he said “I suggest that if you know history, then you might not be so easily fooled by the government when it tells you you must go to war for this or that reason -that history is a protective armor against being misled. Rest in peace, Howard, I thank you for teaching me to look at history through a different lens than was presented to me in school, that government can be as dangerous to a nation as it is useful, and that we all have a responsibility to be informed and aware. But he was not without doubt… he wrote: “I'm worried that students will take their obedient place in society and look to become successful cogs in the wheel - let the wheel spin them around as it wants without taking a look at what they're doing. I'm concerned that students not become passive acceptors of the official doctrine that's handed down to them from the White House, the media, textbooks, teachers and preachers." 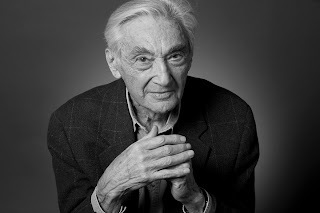 Early on in his career, while working on his book The Politics of History – Howard Zinn went back to revisit the cities that he bombed during the time when he became a bombardier during WWII - he learned that his raids would have killed at least 1000 people – people he could not see from thousands of miles above the ground – he interviewed some of the survivors and heard about the horrors of his actions. This became the turning point for Howard’s life – he said that he received his orders by people who were more interested in career advancement than saving humanity or ending fascism. He said … “I suggest that the history of bombing—and no one has bombed more than this nation—is a history of endless atrocities, all calmly explained by deceptive and deadly language like 'accident,' 'military target,' and 'collateral damage.'" He was a radical through and through; he embodied the idea of speaking truth to power. Zinn’s classes at Boston University were large, often hundreds of students in one class. His classes were popular for his teaching style and growing reputation. He was funny and eloquent and engaging - but he also had a reputation as an easy grader. He was neither a Democrat nor a Republican and did not adhere to any specific party affiliation… and understood that politics can be deceptive and self serving; instead he believed in the people's power. One of the proudest moments of his career came when he was able to finish his most ambitious project, making of the film… “The People Speak” - the film was based on his people’s history and people’s voices – the film is now on DVD and was shown on the History Channel a few months ago – Imagine, Howard Zinn on the History Channel – now millions of people will be witness his incredible body of work – over 20 books and thousands of articles in newspapers and magazines – and just recently People’s History made the NY Times best seller list for non – fiction. He loved his wife Roz – an incredible artist and fierce critic of his work – without her, he would often say, he would not have written People’s History of the United States… They were the most incredible and elegant couple and both of them made you feel like you were the most important person in the world. "An optimist isn't necessarily a blithe, slightly sappy whistler in the dark of our time. To be hopeful in bad times is not just foolishly romantic. It is based on the fact that human history is a history not only of cruelty but also of compassion, sacrifice, courage, kindness. What we choose to emphasize in this complex history will determine our lives. If we see only the worst, it destroys our capacity to do something..."
"If we remember those times and places--and there are so many--where people have behaved magnificently, this gives us the energy to act, and at least the possibility of sending this spinning top of a world in a different direction. And if we do act, in however small a way, we don't have to wait for some grand Utopian future. The future is an infinite succession of presents, and to live now as we think human beings should live, in defiance of all that is bad around us, is itself a marvelous victory." 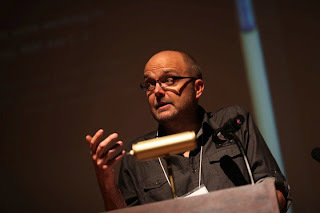 The following pictures are courtesy of the amazing Jill Brazel, who has been documenting our festival. If you or someone you know is in a photo but not identified, please comment below! Social Change Book Fair Today! In addition to readings, panels, workshops, and opportunities to build community across barriers this year, we also want to showcase the significant role of publishers and those who bring us the kinds of writing Split This Rock celebrates: impassioned, visionary, and truth-telling. 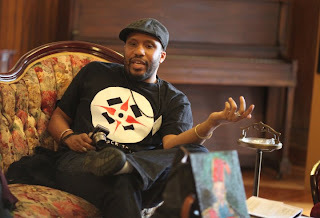 And we want to bring the critically important work of social change groups to poets, activists, and the public. With this in mind, we're introducing a Social Change Book Fair to Split This Rock 2010. 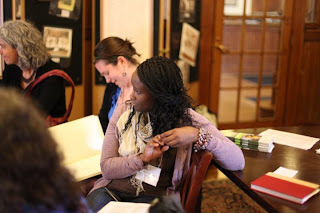 The book fair will be an opportunity to further our mission of getting the critical work of socially engaged poets, writers, organizations, progressive presses, literary magazines, and independent newspapers to our festival participants. The Social Change Book Fair will take place on Saturday, March 13, from 9:30 am to 4 pm at the Thurgood Marshall Center for Service and Heritage (the old 12th Street Y) at 1816 12th Street NW, Washington, DC. 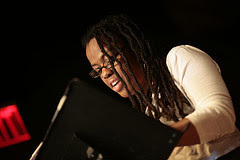 Throaty voice, Mohawked braids, her right hand conducting an invisible orchestra: Diamante Dorsey has the stage. 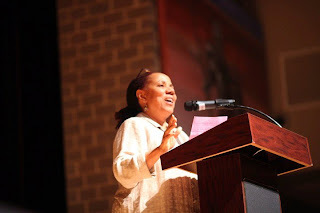 The DC Youth Poetry Slam Finals take place today at Bell Multicultural High School from 2 p.m. to 4 p.m. The final day of the Festival is tomorrow. It will be yet another amazing day. Join us for the Social Change Book Fair from 9:30 - 4:00 tomorrow in the Thurgood Marshall Center Gym. 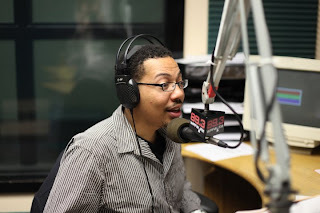 From 12:30-1:30 at Bell Multicultural High School, there will be a Teen Open Mic featuring Jeffrey McDaniel. Allison Hedge Coke holds the Distinguished Paul W. Reynolds and Clarice Kingston Reynolds Endowed Chair of Poetry and Writing at the University of Nebraska, Kearney, and directs the Reynolds Reading Series & Honoring the Sandhill Crane Migration Literary Tribute Retreat. 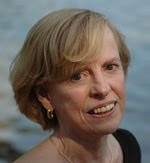 Her five authored books include: the American Book Award winning volume Dog Road Woman and the Wordcraft Writer of the Year for Poetry volume Off-Season City Pipe, both from Coffee House Press; Rock Ghost, Willow, Deer, an AIROS Book-of-the-Month memoir from the University of Nebraska Press; and Wordcraft's Writer of the Year for Poetry in 2007, Blood Run, a verse-play from Salt Publications. Hedge Coke has edited seven additional collections. She came of age cropping tobacco and working fields, waters, and working in factories. Fady Joudah's The Earth in the Attic won the Yale Series for Younger Poets in 2007. Contest judge Louise Glück describes the poet in her foreword as, “that strange animal, the lyric poet in whom circumstance and profession ... have compelled obsession with large social contexts and grave national dilemmas.” He won the 2008 Saif Ghobash – Banipal Prize for Arabic Literary Translation for his translation of poetry by Mahmoud Darwish collected in The Butterfly’s Burden, published in a bilingual edition by Bloodaxe Books in the UK and by Copper Canyon Press in the US. The US edition was short-listed for PEN America’s poetry in translation award in 2009. He was a field member of Doctors Without Borders in 2002 and 2005. His new translation of Darwish's work is titled If I Were Another: Poems by Mahmoud Darwish (Farrar, Straus and Giroux, 2009). Sinan Antoon was born in Iraq and moved to the US after the 1991 Gulf War. His poems, essays and translations have been widely published in Arabic and English (The Nation, Ploughshares, Bomb, World Literature Today, Banipal). His novel I`jaam: An Iraqi Rhapsody (City Lights) has been translated to five languages. The Baghdad Blues (poems) was published by Harbor Mountain Press. His translation of Mahmoud Darwish’s In the Presence of Absence is forthcoming from Archipelago Books in 2010. Antoon returned to Iraq in 2003 to co-direct the documentary film "About Baghdad," about the lives of Iraqis in a post-Saddam occupied Iraq. 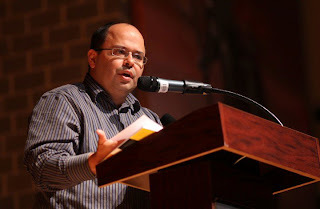 He served as senior editor of the Arab Studies Journal and currently serves as contributing editor for Banipal: Magazine of Modern Arab Literature and as a member of the editorial committee of the Middle East Report. He is assistant professor at New York University. For more information, check out the Facebook event page or the Split This Rock Book Fair page for more details. Both events are free and open to the public! All are welcome! Friday's Schedule for Split This Rock! Are you ready? Tomorrow's the day!